Russian and OPEC officials last week discussed the progress of their landmark crude oil production deal, and plans to increase bilateral cooperation, during multiple meetings and events held in Moscow. 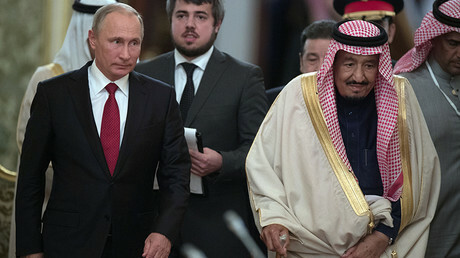 Russia's relationship with Saudi Arabia took center-stage, with the Saudi King’s historic visit to Moscow reflecting the extent to which the two countries are overcoming geopolitical differences and market rivalry to forge a new energy relationship. S&P Global Platts managing editor in Moscow Nadia Rodova discusses this, as well as Russia's cooperation with longer-term partners Iran and Venezuela, with oil editors Rosemary Griffin and Nastassia Astrasheuskaya. NADIA: Hello and welcome to Platts Commodities Spotlight podcast for October 11. I’m Nadia Rodova, managing editor at Platts bureau in Moscow, and I’m joined here today by editors for oil news Rosemary Griffin and Nastassia Astrasheuskaya. We had a busy few days in Moscow last week, which included the Saudi king’s state visit, as well as OPEC ministers taking part in Russian Energy Week. As his visit drew to a close on Friday Saudi Energy Minister Khalid Al-Falih summed up the impact of last week’s meetings on Saudi Arabia’s relationship with Russia and what it means for bilateral energy cooperation going forward. NADIA: Rosemary could you give us a bit more detail on that? ROSEMARY: Hello Nadia, sure. We’ve really seen a shift in the Saudi-Russian relationship recently, both politically and economically. In the past the two countries often found themselves on opposite sides of key geopolitical issues. Also as the world’s largest crude producers they were seen as rivals rather than potential partners. That began to change when they agreed the OPEC/non-OPEC crude production cut deal late last year, and has strengthened as that deal has held. We’re in the middle of seeing Russia and Saudi Arabia forge a new energy relationship. While so far that has been built mainly on their mutual interest in rebalancing oil markets and supporting oil prices, we’re also now seeing the two sides look to increasing bilateral cooperation, signing agreements that could have implications long after the deal expires. NADIA: Right, last week they signed several agreements. Saudi Aramco signed an MOU with Lukoil’s trading division Litasco to set up joint oil trading. This may include supply of Russian crude to Saudi refineries and supply of Saudi crude to Lukoil’s European plants. Furthermore Saudi Aramco CEO Amin al-Nasser said the company is keen to expand its refining, trading and LNG cooperation with Russian companies. This may come on top of MoUs Saudi Aramco signed with Gazprom to look into possible cooperation in the gas sector, and with Gazprom Neft on research cooperation. It also agreed to establish a joint venture with Russian petchems firm Sibur, and set up that $1 billion energy investment fund that Falih mentioned earlier. ROSEMARY: Worth mentioning Russia’s President accepted the Saudi king’s invitation to visit Riyadh, so we may expect a follow-up of this progress soon. NADIA: Indeed. Nastia, we had other ministers from OPEC countries in Moscow last week, including Venezuela and Iran - were bilateral talks a common theme? NASTIA: There was some progress on cooperation between Russia and Iran and Venezuela last week, but Russia’s energy ties with these countries go back to long before the OPEC/non-OPEC deal to curb crude production. Iranian and Russian companies signed MoUs on exploration in Iran, and apparently made progress on the long discussed oil-for-goods deal. Novak expects crude supplies under the deal could start within a month. As for Venezuela, its oil minister Eulogio Del Pino indicated that Russian companies may be interested in offshore development in Venezuela. This would add to Russian involvement in several upstream projects in the country, trading contracts, and joint ownership of a network of refineries in the US. NADIA: Right, we also saw Venezuelan president Nicolas Maduro meet Russian President Vladimir Putin in the Kremlin to discuss restructuring his country’s debt to Moscow. In recent years Russia has proved to be a lifeline to Venezuela, as it struggles to cope with low oil prices and a broader economic crisis. Russia’s top producer Rosneft previously provided Venezuela’s PDVSA with around $6 billion in loans as prepayment for supplies of crude and oil products. What’s also interesting here is that cash-strapped PDVSA used its nearly 50% stake in a major US refiner Citgo as collateral for a portion of the loans, which raised concerns over US energy security if the Venezuelan company defaults on its loans. NASTIA: And Del Pino said the Citgo situation was being discussed last week, and there should be a decision on it “soon.” Besides holding talks on bilateral projects, of course everybody was talking about the OPEC/non-OPEC deal itself. Russian President Vladimir Putin said that while any decision to extend the deal will be taken based on the situation on the market. If there is an extension it will likely be until the end of 2018. ROSEMARY: That was interesting, it’s also still unclear what participants are going to push for in terms of an extension to the deal when discussions reach the decision making stage at the end of this year. For now the ministers are saying they’re satisfied, Falih went so far as to say he is more optimistic on fundamentals now than he has been for the last 2-3 years. Novak and Falih are set to meet at least once again before the Vienna meetings at the end of November. NASTIA: Ministers did comment on one other area of potential change to the deal – new non-OPEC participants. According to Del Pino, the group is in talks with some 10-16 countries to join including Egypt, Uganda, Chad and Congo. NADIA: Right, there’s a lot to follow as we continue to monitor the progress of the deal and the increasingly close relationship between Russia and Saudi Arabia and OPEC. That was Nastassia Astrasheuskaya, Rosemary Griffin, and Nadia Rodova today in the studio. Join us next time for Platts Commodities Spotlight.